The company's slogan describes the product as, "Easy and Incredible Piano Lessons at Your Finger Tips", and certainly, the course does its best to live up to this description. Twenty two years ago, when I first started to take piano lessons, one of my first piano teachers was a graduate from the Juilliard School of Music in New York. Many of the fundamental concepts I learned from her - how to play chords, scales, arpeggios, and integrating proper timing into music - are covered in this course. Students are helped to build on a proper foundation of understanding the structure of music, and not just simply, 'how to read sheet music'. Truthfully, I would have never learned how to play 100s of songs on the piano, had it not been for this teacher's introducing me to these fundamental concepts. Learn Piano in 30 Days does a nice job of leading into this necessary training. The course is hosted and taught by classically trained pianist, singer / songwriter, Rachel James. She takes students through the various stages of learning how to play the piano - from a complete newbie to an intermediate pianist. The course overall is a fast and practical start for most students ages 8 and up. For families on a budget, this program could be one of the best substitutes to paying $27 per piano lesson x 52 weeks out of the year. Personally, I have taught piano for the past 10 years, as well as performed for numerous venues over the past 18 years. When I first heard the cost of $27 per month, the price automatically became a no-brainer for me. Learning how to play the piano, especially for new students, can be a daunting challenge. I have been in the piano student’s seat before, as well as in the teacher's seat. I can certainly understand how new students feel as they take up piano lessons for the first time. As a piano teacher, I can also sympathize with parents who continue to spend money on lessons every week, while monitoring their child's progress, hoping they are receiving the best possible value for their invested tuition. Parents, of course, need the constant reassurance that their child is receiving the best education and training possible, in exchange for their hard earned money. This course, is perfectly suited for middle income households, should be able to fit the bill in most situations. This course can also be a real asset to those who have the desire to begin piano lessons, but who do not have the cash to spare for lessons every week - taken week after week, month after month, year after year. The first thing that caught my attention when I first learned about this course, is the fact that Learn Piano in 30 Days has a vast repertoire of HUNDREDS of the most popular songs people actually know (and prefer to listen to) these days (kids and teenagers especially) from Alicia Keys, to Coldplay, to Taylor Swift, Miley Cyrus, Mariah Carey, Lady Gaga, Avril Lavigne, and many more. New songs are added each month, as long as you remain a member of the program. 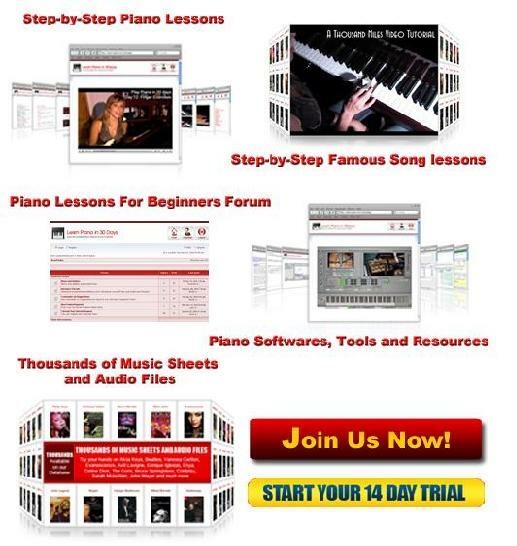 This is more than I knew existed, not only in terms of taking piano lessons online, but with popular piano tutorials wrapped up into one complete package. The part I liked best is this: Suppose your favorite song is not on the list (say for example, the latest Taylor Swift or Demi Lovato song), you can send an email to support, and they will post the tutorial for YOU in the repertoire. This is the only place I know of on the net that provides this service for FREE as past of your membership. Rachel James is a classically trained pianist, singer / song writer, who takes the beginning pianist, who knows nothing about the piano, by the hand, to a complete understanding of the piano’s history, how to get off to a quick start, how to understand basic theory, composition, playing by ear, and even 'how to choose the right piano to buy'. As a piano teacher myself, this is a course I recommend for students to use in between piano lessons. This is that little extra "boost" that helps keep piano students going throughout the week, and to stay motivated with their progress. Say for example they are learning a popular song by Taylor Swift or by the multitude of artists Learn Piano in 30 Days offers. Students can refer to these videos over and over again without needing the teacher to be there to assist. For the money alone, this course is by far a great help to households to save hundreds per month, not to mention the thousands of dollars per year on piano lessons. I would charge my students anywhere from $25-$30 per lesson for a 30-45 minute session. 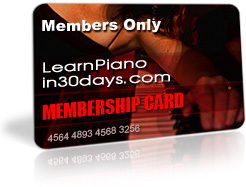 Learn Piano in 30 Days is taught at $27 per month. A great bargain by far, at least in this piano teacher's estimation. My advice is to test drive the course for 14 days for only a dollar, and if it doesn’t work out for you, fine. The knowledge you will gain is priceless. You will be off to a good start, and decide if you want to continue taking piano lessons, starting with only $1, in the comfort and privacy of your own home. Learn Piano in 30 Days gets you off to a fast start, teaching you what you need to know, in the order you need to know it in. My teacher was a Juilliard trained graduate who taught me a great deal about “shortcuts” to master the piano in a short amount of time. This course is but one example of how piano lessons online have come a long way in terms of productivity and cost. Piano students learn in a short amount of time what most piano teachers take weeks to teach, at $27 per lesson, for weeks on end. 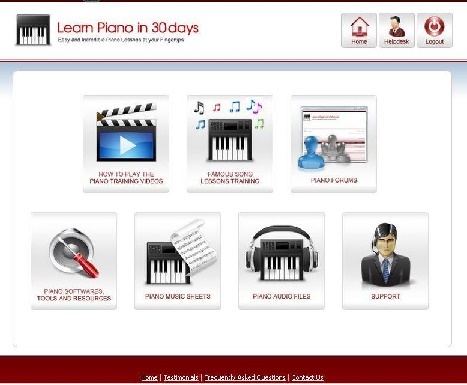 Here is a brief course overview of what Learn Piano in 30 Days is all about. When this was being written I couldn’t find this information anywhere else on the net.. so then, below you will find an “internal exposure” of what the course offers. Becoming a better pianist program - Is the next course after the Learn Piano in 30 Days program which teaches students intermediate skills in addition to the basics they have learned from the previous program. This course allows students to play faster and more complicated songs with ease. Becoming a master pianist program This is their advanced piano lessons program, helping students to play any song they like! If your dream is to become a paid professional pianist, then this course is for you. Play the piano by ear program: These courses teach you how to play any song by ear! Without using any sheet music, you can play along to any song you hear, without music sheets. Try it for a $1 Today. See what happens. What do you got to lose?